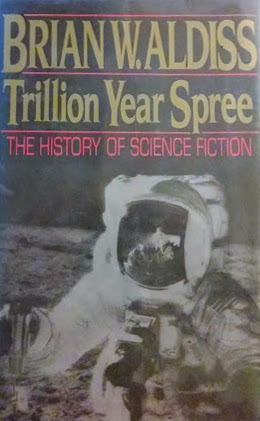 Trillion Year Spree: The History of Science Fiction, Brian W. Aldiss and David Wingrove, Atheneum, 1986, ISBN 978-0689118395, 511pp. It’s no easy task to write a history of science fiction, as amorphous a publishing category as there is, so I hesitate to call this book a failure on those terms alone. What it attempts to do, it does handily and usefully: it brings to light a strand that stretches from Mary Shelley’s Frankenstein to William Gibson’s Neuromancer, the darling of the 1980s (when this book was published). Along the way it pauses long enough to note certain knots in the strand that have made it stronger (woah, I’m really stretching that metaphor out-a-kilter, aren’t I!). Aldiss (who wrote the original version of this book, Billion Year Spree) and Wingrove smartly spend most of the book before the 1960s, focusing on the twin progenitors of modern SF: the intellectual, philosophical style that came from the U.K. from writers like Wells and Huxley with the pulp, mechanistic format favored by America and championed by Gernsback. However, and likely due to the fact that both authors here are also creators, this is not necessarily the most objective critical treatise on the field. Aldiss comes across as someone miffed by the American ascendency in a field that was born with an English authoress, in a kind of literary reflection of the change in world hegemony after the second world war. He shoots a fish in a barrel when he rightly points out that Ellison’s introduction to Dangerous Visions was marketing controversy, counterpointing it with a quite understated and humble editorial by Michael Moorcock from New Worlds. But this one example doesn’t mean that Moorcock wasn’t himself involved in flaunting convention for attention, nor the true power behind some of the stories championed by Ellison (including some of Ellison’s own writing). That is, Aldiss’s obvious bias, likely stemming from where his own publications appeared, is this huge mote that sticks in the reader’s eye once he hits the 1960s, and it’s hard to remove it for the rest of the book. It’s unfortunately, because I think he’s not too far off in his analysis of many of the (at the time of writing) more recent authors, including noting that Gibson was more style than substance. (The funny thing about the latter opinion is that he had just spent the entire chapter on New Worlds praising the New Wave’s addition of style to what had been a gee-whiz-gizmo literature beforehand.) Perhaps if Aldiss had confronted his bias head-on (in no section does he remind the reader that he is, himself, the Aldiss that he mentions in passing in several chapters), it might have been more palatable, or maybe I’m just used to Gardner Dozois’ method of commentary that appears in the introduction to his Year’s Best volumes where, once he comes to the magazine which he himself edited, he simply lists the authors there “without comment.” Trouble is, for Aldiss not to comment on that section of the book would have made for a much shorter work. A conundrum indeed. What I enjoyed most here was learning a bit more about authors whom I may have read, but didn’t know as much about their history, such as H.G. Wells, Edgar Rice Burroughs, A.E. Van Vogt, and Michael Moorcock. As a voracious reader of SF in the 70s and 80s, I thought I had a fairly good grounding in the “classics,” but this book revealed some of my deficiencies, albeit none that I’m necessarily interested in correcting at this late date. It did remind me of why I was attracted to science fiction in the first place, and given me an idea of what I’ve been finding missing in the few titles I’ve read recently. Finally, this is the first book that I’ve read in a long time that has ever tempted me to re-read novels and stories, to view them with new critical eyes having obtained a new perspective from Aldiss on them, such as Tim Powers’s The Anubis Gates, Fred Pohl’s Gateway, and Gene Wolfe’s The Shadow of the Torturer. A final note: I ordered this book from Mark Ziesing, whom I used to order books from regularly not to mention briefly writing a book review column for his print catalog, which he still produces. When I received this book, it had a tipped in review slip from the publisher and Mark had written on a post-it note, “Hi, Glen–I thought you’d enjoy knowing this was Damon Knight’s copy.” It’s a silly thing, but that little bit of knowledge made me feel a part of that science fictional strand that Aldiss wrote about here.